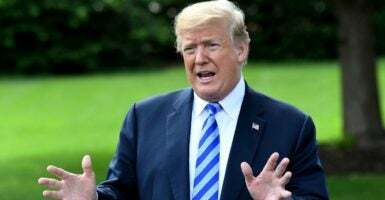 A major conservative-libertarian advocacy group has thrown its support behind President Donald Trump’s call for canceling more than $15 billion in spending as a good first step in reining in the federal budget. Americans for Prosperity praises the president’s rescission request, which would claw back up to $15.3 billion in appropriated but unspent funds, and says it will wage a media campaign to push for Congress to approve the request. The group launched its “Stop Overspending” campaign over the Memorial Day weekend with the aim of encouraging lawmakers to curb excessive government spending through targeted efforts in congressional districts to educate voters about the issue. “Overspending in Washington is a bipartisan problem, and it’s time members of both parties came together to start fixing it,” Riggs said. Trump’s rescission request is the first of its kind since fiscal year 2000. A rescission provides the president with the opportunity to save appropriated but unspent funds through a request to Congress. The funds are “locked up” and cannot be spent unless Congress rejects the proposal. The advocacy group acknowledged what it called the “significant achievement” for American workers of last year’s passage of the Tax Cuts and Jobs Act, but noted that the group long has campaigned for pairing tax cuts with spending restraint. “Unchecked spending in Washington threatens to undermine economic growth,” the group said.